Observatory (SOHO) and the Transition Region and Coronal Explorer (TRACE). Our Sun, Sol, is not like most stars in the Solar neighborhood, or in the entire Milky Way galaxy. It is a single star although many stars have stellar companions, which is fortunate for Earth life because stable planetary orbits like the Earth's are much more likely around single stars. In addition, Sol is among the most massive 10 percent of stars in its neighborhood, which is also means that it is not too cool and dim. Finally, Sol has about 50 percent more heavy elements than other stars of its age and type, but only about a third of their variation in brightness, which is also fortunate because heavy elements are essential to make planets like Earth and large stellar flare-ups can harm planetary life with hard radiation. 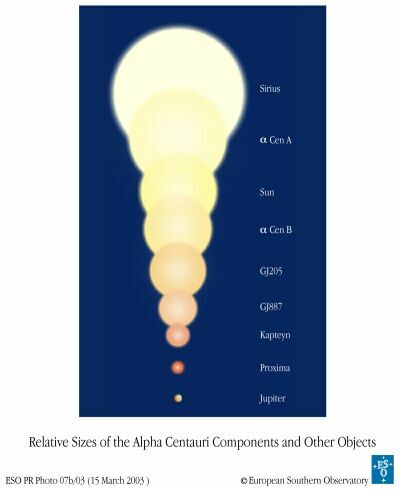 Sol is a yellow-orange, main sequence dwarf star (G2 V -- see spectrum). Born in our Milky Way galaxy's disk about 4.6 billion years ago, it may shine as a normal "dwarf" star for another five billion years. It is relatively rich in elements heavier than hydrogen created by primordial supernovas, and so is called a high metallicity, "Population I" star. Even so, Sol is composed of mostly hydrogen and helium (75 percent and 25 percent by mass, or 92.1 percent and 7.8 percent by the number of atoms, respectively). All other elements amount to only about one tenth of a percent, but this is changing slowly over time as Sol converts more hydrogen to helium then to traces of other elements at its core. 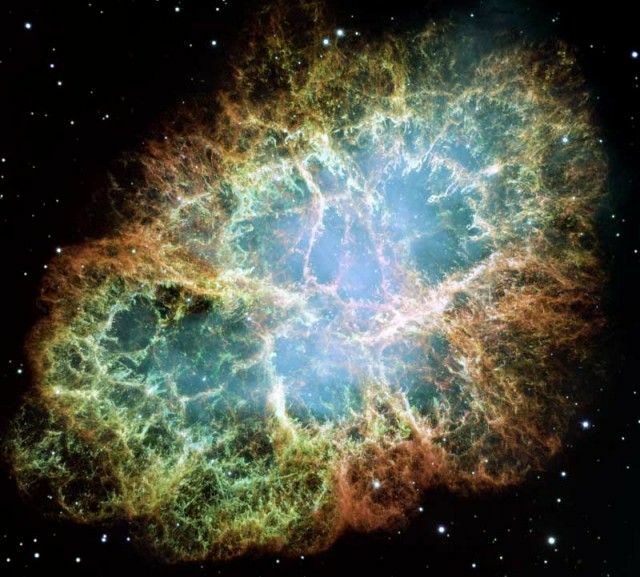 arms where life-threatening supernovas are more common. About 99.85 percent of all the matter in the Solar System lies inside Sol itself. The planets, which condensed out of a protoplanetary disk of gas and dust (made of scarce heavier elements) within the Solar nebula that formed the Sun, contain only 0.135 percent of the mass of the Solar System. Jupiter has more than twice the matter of all the other planets combined. The satellites ("moons") of the planets, comets, asteroids, meteoroids, and dust and gas in the interplanetary medium constitute the remaining 0.015 percent. In January 2007, physicist Robert Erhlich, who has been modelling Sol's core based upon recent work on magnetic instabilities (Grandpierre and �goston, 2005), published calculations on how core magnetic fields may produce small instabilities in the Solar plasma that would induce localized oscillations in temperature. While many oscillations cancel each other out, some reinforce one another and become long-lived temperature variations that allow the Sun's core temperature to oscillate around its average temperature of 13.6 million degrees Kelvin in cycles lasting either 100,000 or 41,000 years. Moreover, random interactions within the sun's magnetic field can flip the fluctuations from one cycle length to the other, matching the paleo-temperature record for ice ages on Earth for over the past 5.3 million years, when ice ages occurred occurred roughly every 41,000 years until about a million years ago when they switched to a roughly 100,000-year cycle. Since subtle changes in Earth's orbit known as the Milankovitch cycles can not be used to explain the million-year-old switch in ice-age cycles, these hypothesized Solar temperature fluctuations may be an important part of the explanation (Robert Erhlich, 2007; and Stuart Clark, New Scientist, January 25, 2007). One of Sol's most unusual features is its orbit around the center of the galaxy, which is significantly less elliptical ("eccentric") than those of other stars similar in age and type and is only slightly inclined relative to the Galactic plane. This circularity in Sol's orbit prevents it from plunging into the inner Galaxy where life-threatening supernovae are more common. Moreover, the small inclination to the galactic plane prevents abrupt crossings of the plane that would stir up the Sol's Oort Cloud and bombard the Earth with life-threatening comets. What's more, the Sun is orbiting very close to the "corotation radius" of the galaxy, where the angular speed (raised to 914,000 kilometers or 568,000 miles per hour) of the galaxy's spiral arms (see chart) matches that of the stars within. As a result, Sol avoids crossing the spiral arms too often, which exposes Earth to supernovae that are also more common there. These exceptional circumstances may have made it more likely for life and human intelligence to emerge on Earth. According to Guillermo Gonzalez (an astronomer at the University of Washington in Seattle), fewer than five percent of all stars in the galaxy enjoy such a life-enhancing galactic orbit. Other astronomers point out, however, that many nearby stars move with Sol in a similar galactic orbit. 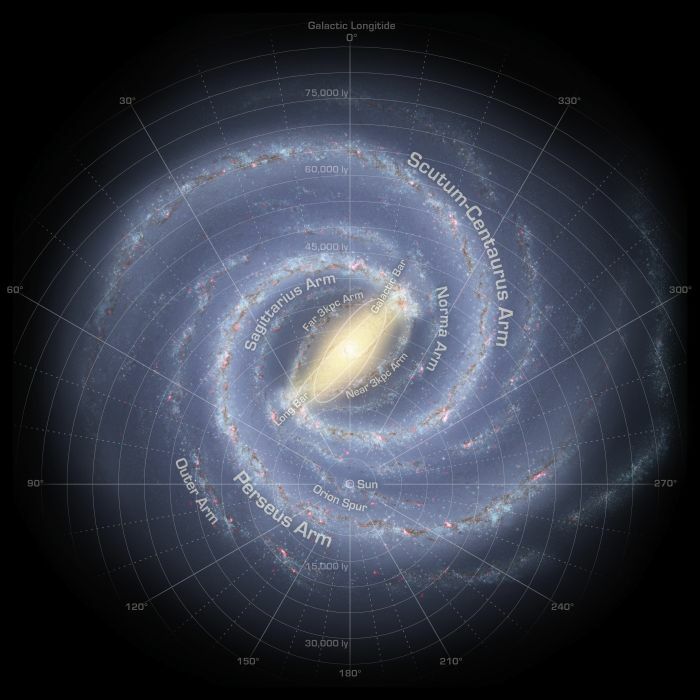 In September 2008, a team of astronomers submitted a paper suggesting that the Milky Way's spiral arms have cast the Sun far from its birthplace over time, based on the results of new numerical simulations. As a result, stars near the Solar System vary widely in their chemical composition because a number of them appear to have been perturbed by the galaxy's arms into "wild" or elongated orbits that move them far from their birthplace. However, this perturbation by the spiral arms still preserves the orbital circularity of many stars (including the Sun) around the galactic center (more from Rachel Courtland, New Scientist, September 17, 2008; Rok Ro�kar et al, 2008; and the Ro�kar team's an animation of how the creation and destruction of galactic spiral arms can causes stars to migrate far from their birthplace). 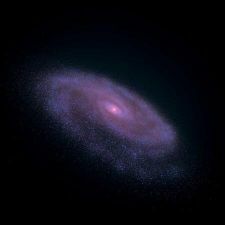 from the Milky Way's spiral arms (more). In recent millenia, the Sun has been passing through a Local Interstellar Cloud (LIC) that is flowing away from the Scorpius-Centaurus Association of young stars dominated by extremely hot and bright O and B spectral types, many of which will end their brief lives violently as supernovae. The LIC is itself surrounded by a larger, lower density cavity in the interstellar medium (ISM) called the Local Bubble, that was probably formed by one or more relatively recent supernova explosions. As shown in a 2002 Astronomy Picture of the Day, located just outside the Local Bubble are: high-density molecular clouds such as the Aquila Rift which surrounds some star forming regions; the Gum Nebula, a region of hot ionized hydrogen gas which includes the Vela Supernova Remnant, which is expanding to create fragmented shells of material like the LIC; and the Orion Shell and Orion Association, which includes the Great Orion Nebula, the Trapezium of hot B- and O-type stars, the three belt stars of Orion, and local blue supergiant star Rigel. On October 4, 2006, a team of astronomers announced the finding of evidence that Sol formed in a fragment (Solar nebula) of a giant molecular cloud (e.g., the Orion Cloud) of gas and dust that gave birth to a large open star cluster with hundreds to thousands of members. According to astronomer Leslie Looney, the evidence for Sol's stellar sisters was found in decayed particles from radioactive isotopes of iron trapped in meteorites, which can be studied as fossil traces of early Solar System conditions. The isotopic evidence indicates that a supernova from a massive star with the mass of at least 20 Solar-masses (probably a very rare, hot, and blue O-type star like Anitak Aa) exploded near the early Sun when it formed 4.6 billion years ago. Measured abundances of the isotopic particle species indicate that the supernova was located only about 0.32 to 5.22 light-years from Sol. Where there are supernovae or any massive star, there should have been hundreds to thousands of low-mass stars like the Sun that were born of the same nebula of gas and dust. 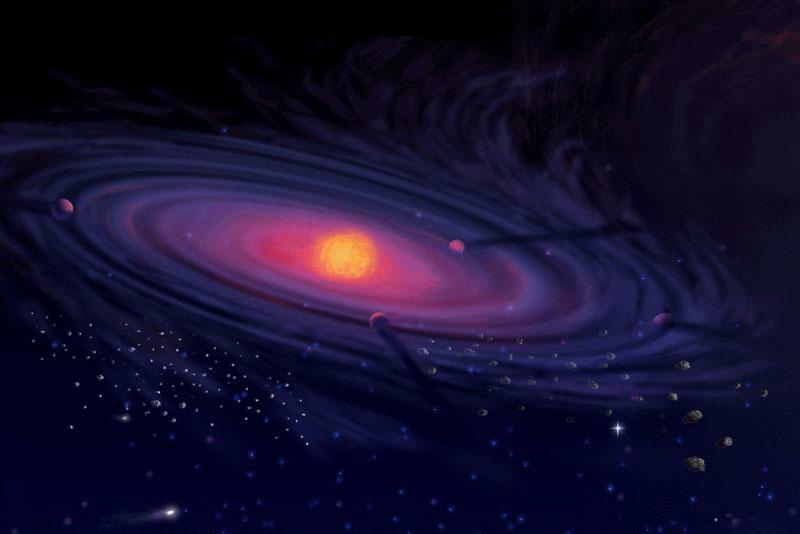 Due to insufficient gravitational pull, Sol's surrounding cluster of stars dispersed over the past five billion years as they moved around the developing Milky Way galaxy, and members escaped the cluster due to velocity changes from close encounters with each other, tidal forces in the galactic gravitational field, and encounters with field stars and interstellar clouds crossing their way (press release; and Looney et al, 2006). left) that exploded as a supernova. 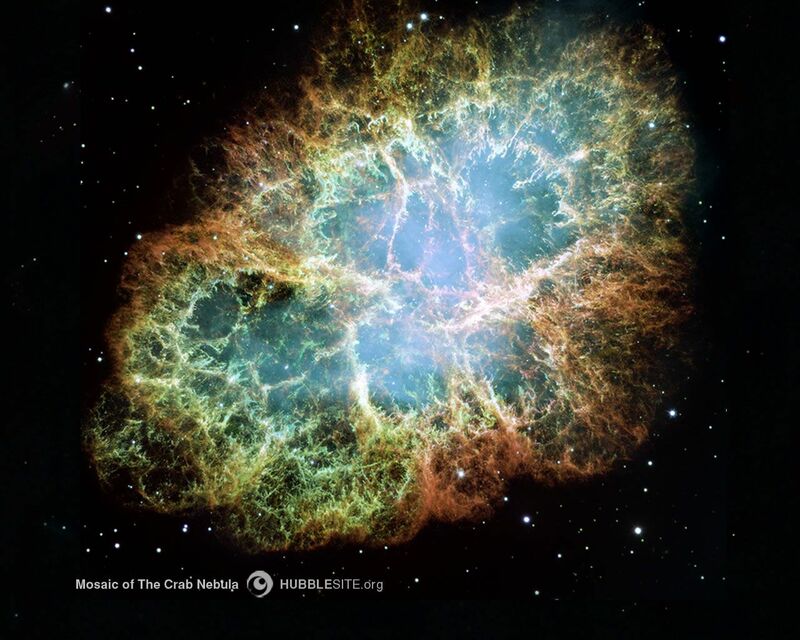 On April 17, 2009, a team of scientists published a paper discussing their conclusions that the Sun formed from a well-mixed nebula containing dust and gas from two different kinds of supernovae. Titanium isotopes (Ti-46 and Ti-50) in meteorites from the Moon, Mars, and in inclusions found in some meteorites believed to be be the oldest rocks in the Solar System were found in very similar ratios, despite their origins in different types of supernovae. While T-46 (containing 22 protons and 24 neutrons) is believed to be created in core processes within massive collapsing stars (type-II supernovae), Ti-50 (also 22 protons but 28 neutrons) should be created, in theory, from the explosion of white dwarfs as Type Ia Supernovae after attracting too much material from a companion star. That these two isotopes from two sources are found consistently in similar ratios suggest that the Solar Nebula was very well mixed or the developing Solar System absorbed a stray cloud of dust that contained both isotopes (Trinquier et al, 2009; and Rachel Courtland, New Scientist, April 16, 2008). one involving a white dwarf (more). On May 24, 2007, a team of astronomers announced that the presence of an isotope of aluminium suggests the Sun was born when an extremely massive star with around 30 Solar-masses released a great amount of energy in winds loaded with aluminium-26. 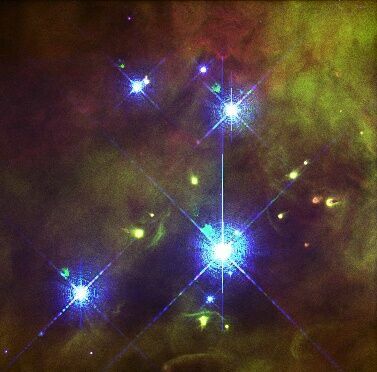 The strong winds of the massive star may have buffeted the Solar nebula sufficiently to initiate the development of the Solar System (Zeeya Merali, New Scientist, May 24, 2007; and Bizzarro et al, 2007; and Shukolyukov and Lugmair, 1993). In addition, the high average abundance of gold in the Solar System suggests that large amounts of the element was injected into matter that eventually coalesced into the Solar nebula by the collision of two neutron stars in a short-duration gamma ray burst (more from Astronomy Picture of the Day). Larger illustration from a movie. Insights Magazine and the movie). In a March 2009, draft pre-print, a computational astrophysicist argued that the chemical abundances found in the Solar System and the observed structure of the Edgeworth-Kuiper Belt constrain the initial mass and radius of Sol's star cluster of birth to between 500 and 3,000 Solar-masses (distributed among an estimated 1,500 to 3,500 stars) within a radius of 5 light-years (1.5 parsecs). Although the cluster dissolved over the past 4.6 billion years with the dispersal of the Sun's sibling stars into the surrounding the Milky Way, the stars should have remained on a similar orbit around the galactic center. While Sol's siblings now lie hidden among many millions of stars, 10 to 60 such stars should still be orbiting the galactic core within a distance of 300 light-years (100 parsecs). With the launch of the European Space Agency's GAIA astrometry mission now scheduled for 2012 (to gather positional and radial velocity measurements for a billion stars within five years and create a 3-dimensional galactic chart of the Milky Way), these sibling stars can be identified with accurate measurements of their level of heavy elements as well as positions and velocities of their motion within the galaxy, and the discovery of even a few such siblings should strongly constrain the original size and location of Sol's birth cluster (Simon P. Portegies Zwart, Scientific American, November 2009, pp. 40-47; and Simon P. Portegies Zwart, 2009). Larger and jumbo mosaic images. The Solar nebula of gas and dust became cold and dense enough to collapse under the force of gravity and form our Sun, Sol, by initiating nuclear fusion of core hydrogen gas. The developing Sun was surrounded by a rotating disk of leftover gas (mostly hydrogen and helium) and dust. 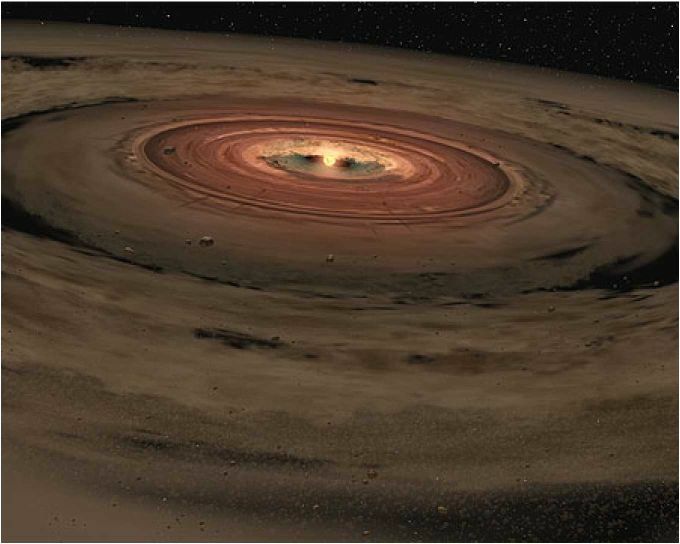 The rest of the Solar System's planets and minor bodies formed from this disk (more). After its birth some 4.6 billion years ago, the Sun had an extremely active magnetic field during its infancy, with gigantic dark star- or Sun-spots that sometimes covered its polar regions. Indeed, sometime after the tenuous gas of the Solar nebula began collapsing into the proto-Sun within its host molecular cloud, a strong magnetic field developed that was instrumental in transporting rotational energy away from its core region in bi-polar jets of gas so that centrifugal forces created by the nebula's collapse did not grow so much as to halt continuing gravitational contraction. 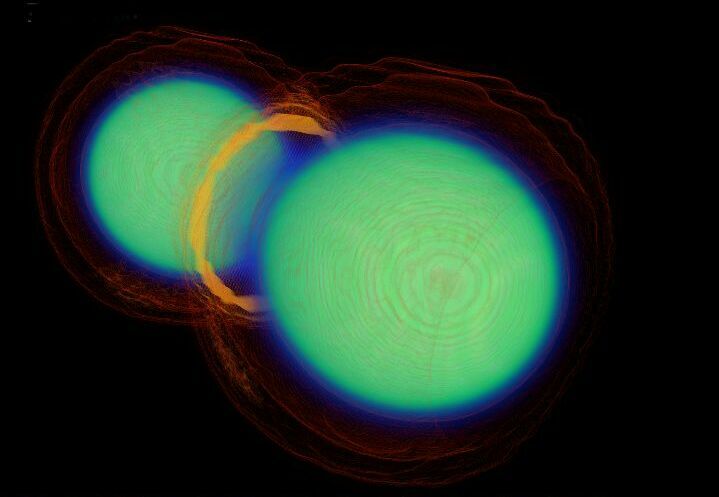 Before Sol finished forming, around a tenth of the gas and dust around it may have been ejected by infalling through its accretion disk and then being blown out by bi-polar jets (more NASA photos) to produce two giant lobes of molecular gas, and bow shocks from the jets hitting the surrounding stellar nebula (painting). Known as Herbig-Haro objects since their discovery in the early 1950s, these lobes typically extend a few light-years in length, have masses similar or larger than the developing star itself, and are moving apart at speeds of tens to a few hundred kilometers (several to tens of miles) per second. Stretching for several light-years, such bi-polar jets may be driven at supersonic speeds by an intense magnetic field at the axis of rotation of an embryonic star less than a few hundred million years old. The gas and dust moving outward carried angular momentum away from the developing Sun and allowed accretion to continue, but also churned up the surrounding nebula and so provided the necessary turbulence to slow down its collapse. Eventually, the supply of infalling matter ran out and shut down Sol's bi-polar jets. Subsequently, much of the surrounding gas and dust that remained around Sol was blown away, by the young star's radiation in T-Tauri winds after core nuclear fusion was turned on. pair of pre-main-sequence stars, XZ Tauri AB. As a result, the planets orbiting the young Sun were subjected to intense X-ray and ultraviolet radiation emitted by the hot gas in the Solar atmosphere. This radiation was also embedded in strong Solar winds that carried magnetic storms outward from the Sun. The combination of radiation and wind helped to get rid most of Earth's primordial atmosphere of hydrogen and helium, while intense ultraviolet light aided the formation of amino acids and other organic precursors to life. While magnetic activity in the young Sun tended to vary irregularly on a time scale of a few years to decades, huge magnetic regions popped onto the surface day by day with dark sunspots covering as much as half an hemisphere, in contrast to only 2 percent at most today. As a result, sunlight emitted towards the Earth may have varied by as much as one half depending on sunspot evolution and on their location on the Sun. 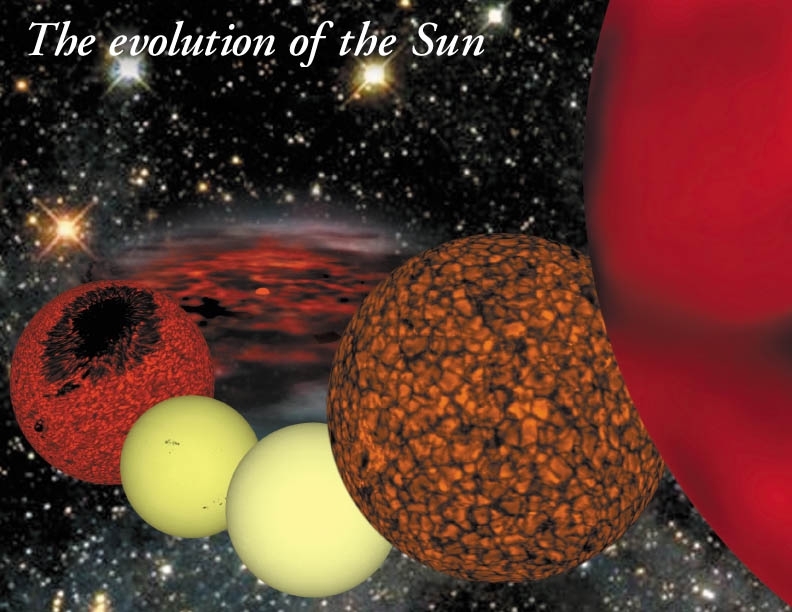 Eventually, however, the Sun settled into a long stable life as a common "main sequence," yellow-orange star as its magnetic activity gradually subsided. and Astronomy Picture of the Day). When life first began to develop on Earth, short-term variations in Sol's brightness were probably limited to a few tenths of a percent. Many Sol-type stars go through periods of diminished activity during which they can get as much as one half to one percent dimmer, as magnetic activity subsides for decades or longer. 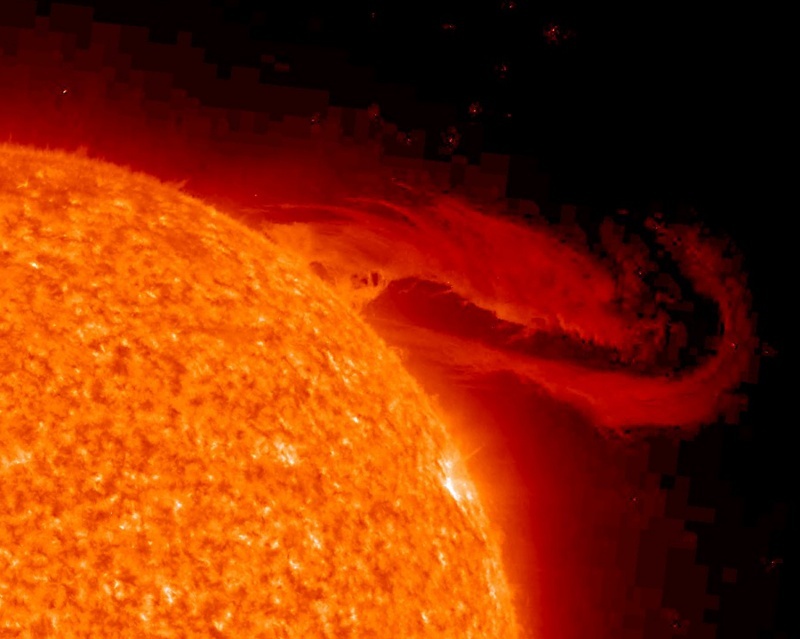 A prolonged reduction in Solar luminosity could send Earth into another ice age. Indeed, one such episode known as the Maunder minimum may have triggered the Little Ice Age from 1645 to 1715 CE, when crops failed in Northern Europe and London's Thames River stayed frozen in June. According to Sallie L. Baliunas, an astronomer at the Harvard-Smithsonian Center for Astrophysics, such diminutions of Solar activity contributed to 17 of the 19 known major episodes of extended chill downs of Earth's climate in the past 10,000 years. Sol is becoming hotter and brighter as fusion of helium "ash" becomes more statistically common with the gradual depletion of hydrogen at its core, which may be half helium after 4.6 billion years of hydrogen fusion. Initially, this helium ash is inert and as it accumulates, the efficiency of nuclear fusion of core hydrogen and other processes decreases and the core produces less heat to maintain internal pressure. As a result, gravity works more efficiently to contract the center of the Sun and raise internal pressure to heat up the core more, which raises the overall energy transmitted to the surface. Astronomers believe that Sol has gotten at least 30 percent brighter since the formation of its planets. Sol is expected to become another 10 percent brighter over the next 1.1 billion years, and so Earth may become too uncomfortably hot for even microbial life in another 500 to 900 million years. 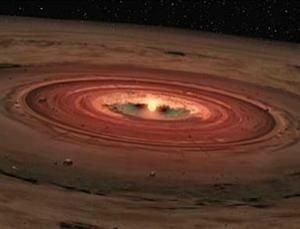 diameter may grow to around the size of Earth's orbit. 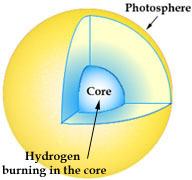 Eventually, the core will get so hot from gravitational contraction that helium fusion ignites, creating carbon and oxygen (with continuing trace activity of other nuclear processes). 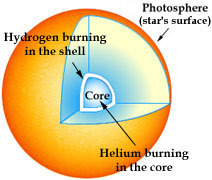 Since core helium fusion is hotter than hydrogen fusion, Sol's convective outer envelope will be heated to expand greatly outwards, and the Sun will leave the main sequence to start a 700-million-year phase as an orange-red giant star. While Sol's surface temperature may drop with the expansion of the convective envelope, overall radiative energy released through its expanding surface area will grow. According to Greg Laughlin (NASA's Ames Research Center) and Fred Adams (University of Michigan), computer models suggest that the Sun's core hydrogen will be exhausted in 6.2 billion years. By this time, it will be 2.2 times brighter, enough to light up Mars as much as it does Earth today. Because surface gravity weakens as a star's convective envelope expands, the convective bubbles -- that span only about 620 miles (1,000 km) on Sol today and are too small to be visible to the naked eye -- will become much larger as the star grows in size. According to Carolus J. 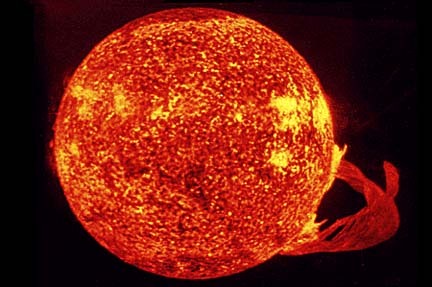 ("Karel") Schrijver, an astrophysicist at the Lockheed-Martin Solar and Astrophysics Laboratory, only a handful of huge convection cells will cover the surface of the Sun when it becomes a orange-red giant star. These cells will undulate by millions of miles as their convective flows evolve, so that Sol will generally look oddly distorted when compared with today's spherical shape. As a giant star, the Sun will become as much as 5,000 times brighter, and its radius will expand as far out as the Earth's current orbital distance of one AU. Sol's brief giant phase will eventually melt the Earth's now parched, rocky surface. Like Mercury and Venus, however, the Earth may also may spiral into the Sun from frictional drag if it is engulfed by Sol's now giant atmospheric envelope. By 6.5 billion years from now, the Sun may have become a 0.88 Solar-mass red giant, blowing much of its distended outer layers of hydrogen and helium through the Solar wind. Eventually, the Sun's hotter, core helium burning will lead to the loss of 44 to 45 percent of its current mass as an asymptotic giant star, from an intensified Solar wind that eventually puffs out of its outer gas envelopes of hydrogen and helium (and lesser amounts of higher elements such as carbon and oxygen) into interstellar space as a planetary nebula. The result will be a planet-sized, white dwarf core that gradually cools and fades in brightness from the shutdown of thermonuclear fusion. (Nearby white dwarfs include solitary Van Maanen's Star and the dim companions of Sirius, Procyon, and 40 (Omicron2) Eridani.) This white dwarf of 0.55 Solar mass will exert a weaker gravitational pull on the remaining planets. Hence, if the Earth has survived Sol's giant phases, its orbital distance fron Sol will expand to 1.6 to 1.7 AUs, and so an Earth year will last up to around 1,100 days. Over time, the Milky Way's spiral arms have cast the Sun far from its birthplace, according to new numerical simulations. As a result, stars near the Solar System vary widely in their chemical composition because a number of them appear to have been perturbed by the galaxy's arms into "wild" or elongated orbits that move them far from their birthplace. However, this perturbation by the spiral arms still preserves the orbital circularity of many stars (including the Sun) around the galactic center (more from Rachel Courtland, New Scientist, September 17, 2008; Rok Ro�kar et al, 2008; and the Ro�kar team's an animation of how the creation and destruction of galactic spiral arms can causes stars to migrate far from their birthplace). As of November 8, 2010, the Solar System is known to have eight major planets and numerous minor planetary bodies, including some relatively large dwarf planets. The following star systems are located within 10 light-years of Sol. Try Professor Jim Kaler's Stars site for other information about the Sun at the University of Illinois' Department of Astronomy. A fact sheet on the Sun is also available from NASA's National Space Science Data Center. For more information about the Solar System, go to William A. Arnett's website on "The Nine Planets", or to Calvin J. Hamilton's website on "The Solar System." Up-to-date technical summaries on Sol can be found at: the Astronomiches Rechen-Institut at Heidelberg's ARICNS, NASA's NStar Database, and the Research Consortium on Nearby Stars (RECONS) list of the 100 Nearest Star Systems. Additional information may be available at Roger Wilcox's Internet Stellar Database.